The report, published to mark the British Business Bank’s two-year anniversary, draws on the Bank’s own research together with other publicly-available data. It highlights the significant opportunities for ambitious, high-growth businesses in the North of England ahead of the Northern Powerhouse Investment Fund (NPIF)’s formal launch in early 2017. The Northern Powerhouse area is already home to more than one million private sector businesses. The region’s economy generates 19% of UK GDP. Long term economic challenges include how to increase productivity from below the national average. The Northern Powerhouse accounts for 21% of the UK’s high growth businesses (those that grow their staff by 20% or more per year over three years, having started with over 10 employees) – competitive with any English region outside of London. Only 7% of SME equity investments by value went to the North, however, in 2015. The economy of the North is bigger than the economies of a number of other European countries including Norway, Poland, Ireland, Finland, Greece, Denmark, Austria and Belgium. The establishment of the Northern Powerhouse Investment Fund is a hugely important part of the future funding of the region, and is the result of close collaboration between the British Business Bank and the ten Local Enterprise Partnerships in the North West, Yorkshire and the Humber, and the Tees Valley. 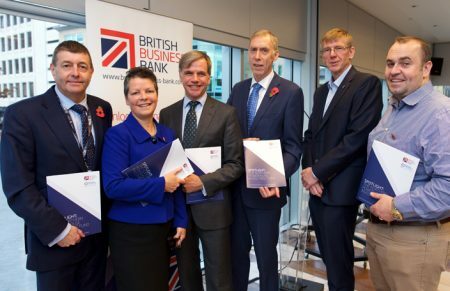 The British Business Bank has worked with the Local Enterprise Partnerships, the Department for Business, Energy and Industrial Strategy, and the Department for Communities and Local Government to direct European Regional Development Fund money into the fund. The British Business Bank is also investing £50m of its own capital in NPIF. The £400 million fund is a central component of the government’s drive to boost long term growth and to narrow the historic North-South funding gap. NPIF will operate alongside a separate fund for the North East Local Enterprise Partnership (LEP), meaning that over £500 million of new investment in smaller businesses will be facilitated within the Northern Powerhouse region. At the same time, NPIF will help nurture the networks and wider ‘ecosystem’ that can continue to support these businesses as they grow. Its programmes have delivered a total of £4bn in lending and investment over the two-year period, generating an additional turnover of £8.5bn in small businesses across the UK. This finance has resulted in nearly £3bn of additional gross value-added in the economy. It has achieved this while delivering a positive return on capital employed to the taxpayer. The Bank has also helped create a more diverse finance market, supporting new lenders and forms of finance. Over 90% of its finance is deployed through finance providers other than the Big Four (high street) banks. Its Business Finance Guide, co-published with the ICAEW and with contributions from across the finance sector, has also helped raise smaller businesses’ awareness of their funding options, reaching over 700,000 businesses.